December ECN Meeting "Year-End Meet and Greet"
December EMB-018 "Neuroengineering: Electronic Interfaces with the Brain"
Please Register at the IEEE-Madison event page. Non-member guests are always welcome. Talk: Meet other entrepreneurs and consultants in the Madison area. It is open to all - bring a friend or colleague. Be prepared to give give a brief introduction to what you do ("Elevator Speech"). This is your opportunity to discuss your company, or your consulting expertise. RSVP: Please Register at the IEEE Madison Section event page. Talk: This talk outlines a wide array of approaches where building electronic devices for interfacing with nervous tissue can aid in the study, diagnosis and treatment of neurological disease. Applications will cover topics ranging from advanced prosthetic devices to building artificial neural circuits in a dish. Bio: Justin Williams is currently the Vilas Distinguished Achievement Professor at the University of Wisconsin as well as the Chair of the Department of Biomedical Engineering. He received undergraduate degrees in Mechanical Engineering and Engineering Physics from South Dakota State University, Masters and PhD from Arizona State University in Bioengineering, and Postdoctoral Training at the University of Michigan in Neuroengineering. He has raised almost $20Million in grant funding for his work and published more than 120 scientific papers. His work has garnered numerous awards, including the Coulter Foundation Young Investigator Award and Time Magazine’s top ten inventions of 2009 and he has also been named a fellow of the American Institute of Medical and Biological Engineering. December EMB018/Section Meeting: Justin Williams will give a talk that is at the state of the art in Biomedial Research. 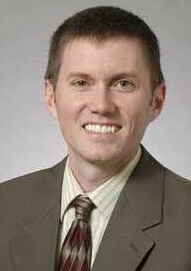 He is head of the Neural Interface Technology Research and Optimization (NITRO) Laboratory, part of the Department of Biomedical Engineering at the University of Wisconsin-Madison. The lab was created to develop new devices for recording from and stimulating neural tissue, design these devices to be both durable for long-term implantation and safe for use in humans and animals, and use these technologies in a variety of situations, from use in a basic physiology lab recording from single neurons, to clinical settings where people with motor disabilities might benefit from a brain-computer interface or other neural prosthetic communication device. January Section Meeting: Is tentatively scheduled for Tuesday, January 17th and will be a talk by Bethanie Stadler who works on the integration of nanomagnetic and photonic materials with a variety of platforms to allow the development of practical devices and systems. This includes magnetic nanowires for magnetoelectronics (including hard drive heads), microfluidic flow sensors and actuators, acoustic/vibration sensor applications, and cellular biomarkers. Madison Section Officer Nominations and Elections are nearly at hand. You will be receiving an e-mail ballot in December for Section Officer Elections. Chair, Vice Chair, Secretary, Treasurer and four Member-at-Large positions will be voted on. Please vote! Micro Volunteers: Do you have some time to spare to help IEEE-Madison Section? Perhaps you have a meeting topic that you would like to see us host and could find a speaker. Maybe you have time to call a few members who might have forgotten to renew their membership. Middle School Adult Mentors Needed: Would you like the opportunity to give a young person a glimpse of real science research? You might help them see that a career in science is a possibility for their future. You can give them an understanding of what scientists do, how they think and why science is important in their daily lives. Anyone with an interest in science can be a mentor! ARMS (Adult Role Models in Science) matches trained science volunteers with middle school students interested in research for the Madison Middle School Science Symposium. The volunteer mentors meet with students at their schools for one hour each week for several months, working on a real research project. Meetings are usually on the same day each week between 3 and 5 pm, but there may be other options of times and locations. Some meetings can be via phone or Skype. Students present their research at a city-wide symposium on the UW-Madison campus each spring. See: Madison Middle School Science Symposium (See Here). Volunteer Mentors must fill out a Mentor Survey form, a Volunteer Disclosure Form, and participate in a Training Session. Please contact Dolly Ledin with questions: daledin@wisc.edu or to volunteer. The third Thursday of January through May, and September through December is reserved for a meeting to provide recent research, developments, trends and/or innovations in one of our membership's technical areas. The first Thursday of January, March, May, September and November is reserved for a meeting on a topic selected from a broad range including such areas as technology, science, history, culture and leisure. 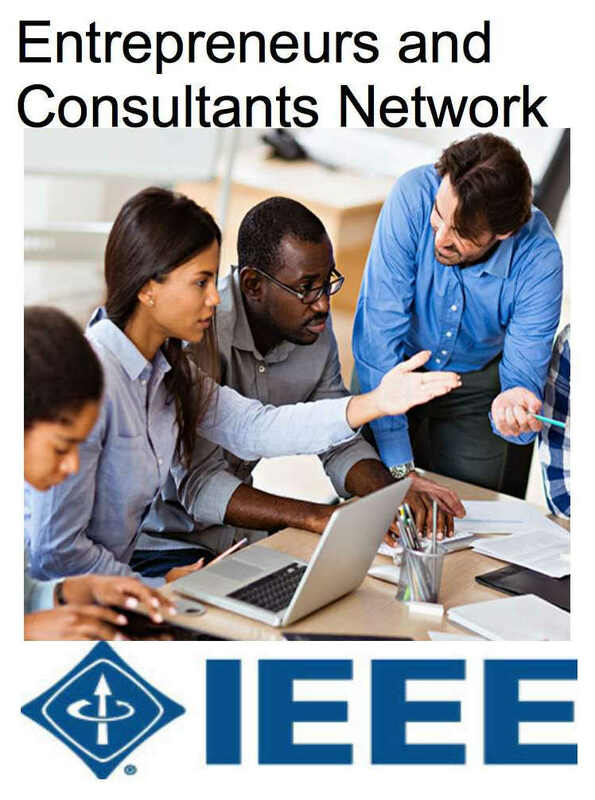 Those interested in upgrading their IEEE membership level should send their resumes or other information showing five years of significant performance in an IEEE-designated field to Charles J Gervasi via email at cj(at)cgervasi.com. Madison Section Board will attempt to find Senior IEEE members knowledgeable in the applicant’s area of practice who may be able to provide references. You are invited to attend the informal networking portion of the monthly Section meetings (starting at 11:30am) to meet the Section Board members and discuss intentions. The Institute of Electrical and Electronics Engineers or IEEE (read Eye-Triple-E) is an international non-profit, professional organization dedicated to advancing technology innovation and excellence for the betterment of humanity. IEEE and its members inspire a global community through IEEE's highly cited publications, conferences, technology standards, and professional and educational activities. It has the most members of any technical professional organization in the world, with more than 300,000 members in around 150 countries. The IEEE consists of 38 societies, organized around specialized technical fields, with more than 300 local organizations that hold regular meetings. Discover what IEEE Member Discounts can offer you. The Member Discounts portfolio consists of insurance products and programs for the home, office and travel, all at excellent group rates and reduced pricing. Visit IEEE Member Discounts to see what’s available in your location and enjoy the savings. 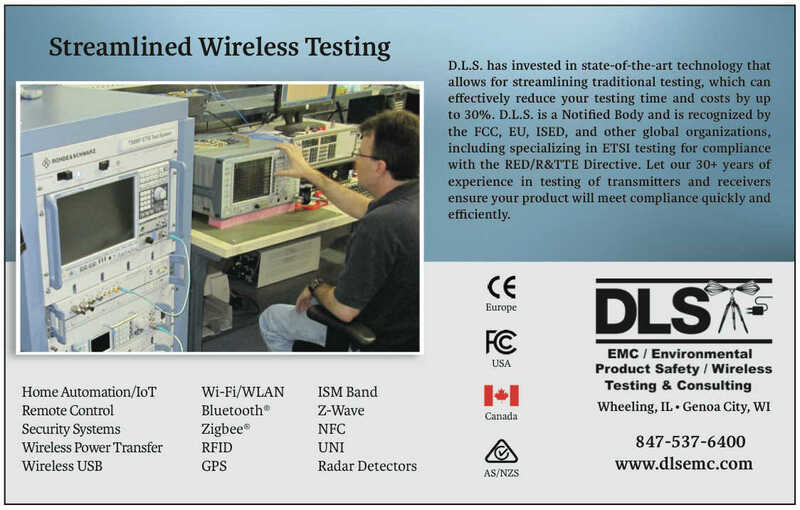 For more information, please visit: IEEE.ORG. The IEEE-Madison Section of the IEEE is a section in Region 4 of the IEEE-USA organized to serve IEEE members in the Madison, WI area with over 600 members. The 2016 Officers and Board Members are Charles Gervasi - Chair, Matthew Bartlett - Vice Chair, Tom Kaminski - Treasurer, Steve Schultheis - Secretary, Timothy Chapman - Webmaster, Tom Kaminski - ECN Chair, Dennis Bahr - Engineering in Medicine and Biology Chapter Chair, Ann E. Thompson - Educational Activities Chair, Charles Cowie - Life Member Affinity Group Chair, Chuck Kime - Life Member Affinity Group Vice Chair, Scott Olsen - Membership Development Chair, Members at Large: Mitch Bradt, Clark Johnson, Craig Heilman, Dennis Bahr, Sandy Rotter. 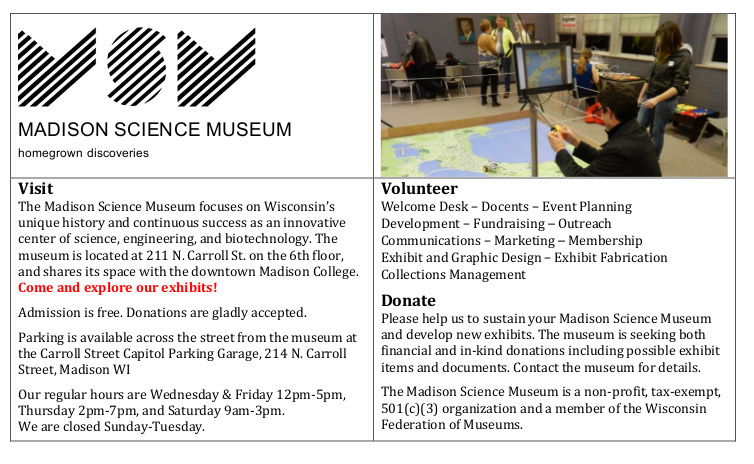 The IEEE-Madison Section has a number of volunteer positions open if you are interested in helping out. Please direct any questions or comments to Tom Kaminski (Newsletter Editor) via email to tjkaminski(at)ieee.org. The IEEE Madison Section Newsletter Published 9 times per year (Jan-May, Sep-Dec) by the Madison, Wisconsin Section of the Institute of Electrical and Electronic Engineers (IEEE), for its members in South-Central Wisconsin. Online at http://ieee-msn.truenym.net/ For address changes: notify IEEE headquarters at: http://www.ieee.org/ or address-change@ieee.org. Editorial or comments contact: Tom Kaminski <tjkaminski at ieee.org>. Permission to copy without fee all or part of any material without copyright notice is granted provided the copies are not made or distributed for direct communication advantage, and title of the publication and its date appear on each copy. To copy material with a copyright notice requires specific permission. Please direct all copyright-related inquiries or requests to the IEEE Copyright Office. Thank you.